I thought my love for this would stop at the title - which is so cute, especially because I'm from the UK and love me some Early grey - but then I kept reading and fell in love. You're really good with details and creating atmosphere - keep writing! My only CC, and this is a small one, would be to incorporate a bit more punctuation into your writing. You can use semi colons to keep topics together, so that the reader can take a natural pause but not lose the subject and dashes. Dashes are my fave for emphasis in places. But that's it! Really want to write a pirate story - there aren't many around! Does anyone know of any good swashbuckling stories? 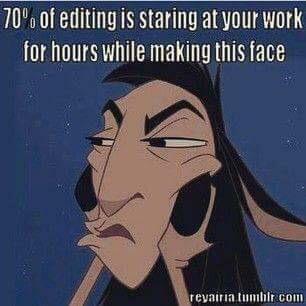 I know we all love writing and reading each other's stories - but is anyone finished with a manuscript and at the stage where they feel they need extra eyes? I wondered what the deal was with Critique partners on here - do you ever exchange emails and chapters and provide feedback? If so, I'd love to sync up and share this task with someone! We can exchange emails and maybe first few chapters and take it from there? mumbled "Struggling with corny confessions of love"
Writing the final scene for my YA book The Fox and my male MC tells the heroine that he loves her. She doesn't believe it, because of all the difficult things she's been through in her life. But he tells her why. Is this paragraph too cheesy? Hmmm, I'm kind of not a fan of the fact he only mentions what her struggles have made her, not like little things about her (like how she fiddles with her hair when she's excited or something) :). You do have a nice writing style though! mumbled "Damn, this is so true!"